The Kentucky Department of Agriculture’s newly released Pollinator Protection Program is designed to be a voluntary tool between chemical applicators and beekeepers in an effort to reduce hive mortality. 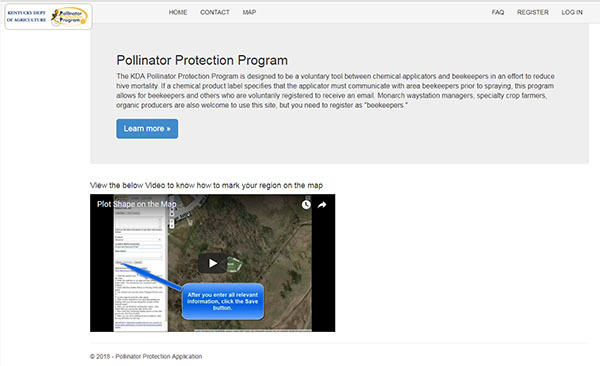 If a chemical product label specifies that the applicator must communicate with area beekeepers prior to spraying, this program allows for beekeepers and others who are voluntarily registered to receive an email. Monarch waystation managers, specialty crop farmers, organic producers are also welcome to use this site, but you need to register as “beekeepers. To participate, go to the website and register as a user. You will then be able to login, list the location of your hive(s), and draw a polygon on a map indicating the location of your hives. Nearby pesticide applications trigger the email to beekeepers. If the label requires notification to beekeepers, the program assists in that effort. The program is free, voluntary, and anonymous; all your beekeeping information is private to you. The information for the applicator is displayed once he/she enters the details of the application. The applicator enters the chemicals and the proposed date and time of spraying. The software locates any affected hives and automatically sends notification emails to the beekeepers. It is important to name your hive distinctively, especially with multiple hives in the system; the email program will use the name for your hive that you give it when you sign up. All beekeepers are encouraged to sign up for the program. You can sign up for the program at any time, but are highly encouraged to do so before the pesticide application trainings begin in March. A video on the home page takes you through the registration steps, showing you how to mark your hive area on the computer map.